Firefox Accounts (FxA) is an identity provider that provides authentication and user profile data for Mozilla cloud services. Longer term we envision that non-Mozilla services and applications will also be able to delegate authentication to Firefox Accounts. 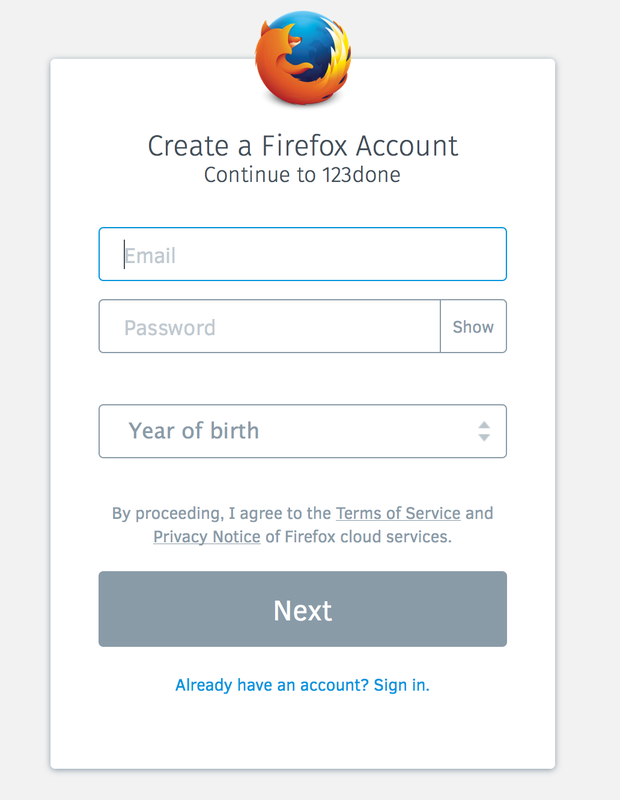 Firefox Accounts OAuth integration is currently limited to Mozilla relying services. We have the intention to, in the future, allow third-party services to delegate authentication to Firefox Accounts, but have no committed timeline for this. Going forward, our OAuth 2.0 API will be the preferred method of integrating with Firefox Accounts, primary because it gives relying services access to user profile and other data and we anticipate it will be available on all platforms. This will enable us to have a common, uniform way for relying services to integrate with Firefox Accounts. redirect_uri - a GET HTTPS endpoint on your service that we can transfer control back to after user authentication has completed. client_secret - a 32 byte hex encoded secret for your service to authenticate itself to the back end FxA OAuth service. This value is secret. Despite its name, this value should never be stored on or given to untrusted client code on users' machines. It should only be used from the service's backend machines to access authenticated API endpoints on the Firefox Accounts OAuth server (e.g., https://github.com/mozilla/fxa-oauth-server/blob/master/docs/api.md#post-v1token. For development purposes you can use the Firefox Accounts OAuth Credential Management dashboard to provision credentials. However, we currently have no automated way to provision relying services in production. The client_secret is your responsibility to keep safe. If you lose it, we have no way to recover it, and it will be necessary to issue you a new secret. oauth_uri - the FxA OAuth endpoint. In production, this is https://oauth.accounts.firefox.com/v1. For self-hosted, dev, or staging environments, this will be different. [optional] profile_uri - the FxA Profile endpoint. In production, this is https://profile.accounts.firefox.com/v1. For self-hosted, dev, or staging environments, this will be different. [optional] content_uri - the origin of FxA login page. In production, this is https://accounts.firefox.com. For self-hosted, dev, or staging environments, this will be different. This is only required by the Firefox Desktop OAuth client (available in chrome) and can be omitted in Web contexts. Navigate the user's client to the FxA OAuth authorization endpoint. In production, this is https://oauth.accounts.firefox.com/v1/authorization. This request must include URL query parameters for the service's client_id and a state value. Refer to the FxA OAuth documentation for further information about this step and optional parameters. code - an alphanumeric string that the relying service can exchange for an Firefox Accounts OAuth 2.0 token for the user with the FxA OAuth /v1/token endpoint. A code typically has a lifetime of 15 minutes. If the above security checks pass, the relying service can proceed to exchange the code provided in the redirect from Firefox Accounts for an OAuth token for the user. This must be done from the relying service's backend server and not from untrusted client code. The service can exchange the code using the FxA OAuth /v1/token endpoint. Refer to the linked documentation for further details. The relier client can be installed via bower, by fetching the latest version from GitHub, or from building from source. The fxa-relier-client can be used as a standalone module or with the RequireJS and Browserify module loaders. Trade the returned code for a token, which can be used to access OAuth protected resources. When either signUp or signIn are called, the user will be redirected to Firefox Accounts to authenticate. Once the user has finished authenticating, they will be redirected to the URL specified in `redirectUri`. See the section "Redirect back to relying service." If the relier library is not working as expected, first look in the browser's developer console to see if any error messages have been displayed. Useful error messages are displayed whenever required parameters are missing or not of the expected format. Next, ensure the API is being called correctly; full API documentation is available on GitHub. If there is still a problem, chat with the folks in the #fxa channel of mozilla.irc.org. An email can be pre-filled by calling signIn or SignUp with an `email` option. `forceAuth` forces the user to sign in with the given email address. If the email address has not been registered with Firefox Accounts, the user will be unable to register. // force the user to authenticate as the email provided. Instead of redirecting away from the relying site, Firefox Accounts can be displayed in a lightbox. The API is promised base to allow the relying site to be notified when the authentication is complete. When the user has completed authenting, the promise will resolve with a result object that contains three fields: redirect_uri, code, and state. The redirect_uri is the URI the user would have redirected to had the redirect flow been used. code and state are normally POSTed to the server to verify and access protected information. See the section "Redirect back to the relying service" for information on how to complete the OAuth transaction. // sign up a user using the lightbox. // state - state token that should be compared to prevent CSRF attacks. // an OAuth token which can be used to access protected information. // If `err` was generated by Firefox Accounts, it will contain a `reason` field. By default, the fxa-relier-client interacts with production servers. The fxa-relier-client can talk to an alternate server stack by specifying which servers to communicate with in the FxaRelierClient constructor. The list of servers can be found in the section "Firefox Accounts deployments." Going forward we anticipate the FxA BrowserID based API will primarily be used by internal FxA applications. Integrating services should instead use FxA OAuth. However, on Firefox OS, the BrowserID DOM API is the recommended method for integrating with Firefox Accounts. The Firefox Accounts BrowserID is available to chrome code in Firefox Desktop and Firefox of Android. It also available to chrome code and certain restricted applications in Firefox OS. Documentation for integrating with FxA on FxOS using the DOM API is here. After a relying service has obtained an FxA OAuth token for a FxA user, it can access Mozilla service APIs that use FxA OAuth. This is largely a work in progress, and we expect the number of APIs that use FxA OAuth will grow and evolve over time. The Firefox Accounts profile server stores and provides user "profile data". Currently, a user profile consists of a stable user identifier (uid) and email address, but in the future we anticipate it will include an avatar image, screen name, phone number, preferred locale, and other information. Please refer to the FxA profile server documentation for further information. We provide FxAccountsProfileClient.jsm for easier Firefox Desktop integration. URLs for various production, stage, and development deployments.